We believe the highest quality experiences occur with small groups, paddling single kayaks, through remote wilderness. Butterfly Tours offers a wide variety of trips for paddlers with different levels of kayaking ability. We offer one of the smallest groups as well as the most experienced sea kayak guide in Gwaii Haanas National Park. Join us to explore the ancient Haida village of SGang Gwaay. Our group size is six guests plus two guides. Tours and expeditions for different levels of ability. A wide variety of trips. Specializing in the remote southern tip of Gwaii Haanas. Thirty-eight years of Haida Gwaii kayaking experience. Quality, experience and professional risk management. Organic food, prepared over driftwood beach-fires. Tasty meals and professional campfire cooking. Accommodation at the Rose Harbour Guest House. Experience this fascinating homesteader community. Direct contact with the owner & guide. Consistency from beginning to end. We are the only Gwaii Haanas outfitter specializing in single kayaks. Every Butterfly Tours guest is provided with a single kayak for the entire trip. Enjoy the freedom and rewards of paddling your own craft. Other outfitters provide either a fleet of double kayaks, or a mixed fleet of double and single kayaks. With mixed fleets, the limited number of single kayaks often become very popular, requiring each person to wait their turn before enjoying the independence of paddling a single. On our wilderness kayak journeys, every person is provided with the uninterrupted opportunity to experience Haida Gwaii by single kayak. Our guides are accomplished kayak instructors; we help people develop efficient paddling techniques. Each guest is provided with the opportunity to learn how to effectively propel a single kayak. Arriving with reasonable balance, reflexes, fitness and coordination will enable most paddlers to enjoy touring at optimum cruising speed in our single kayaks. The ability to maintain a positive attitude during challenging moments is also a great asset. Single kayaks are not suitable for everyone. Many people distinctly prefer paddling a single kayak; however, not everyone aspires to be responsible for the propulsion of their own vessel. If you are interested in our trips and want to invite a friend, please be sure that your friend also seeks the additional rewards and challenges provided by a single kayak. See more information on inviting a friend or partner. Those who would prefer the different challenges associated with paddling a double kayak may be interested in using our Seaward Southwind. Keep in mind we do not supply a partner for our double, as we provide each person the opportunity to paddle a single kayak. If you would prefer using our double kayak, please be sure to arrive with a paddling partner. We encourage the process of informed selection that occurs while people decide which outfitter to choose. Other outfitters provide either an entire fleet of double kayaks, or a mixed fleet of singles and doubles. Butterfly Tours specializes in single kayaks. Our Kayak Mothership Cruise provides one double kayak plus six single kayaks. We offer one of the smallest kayak tour groups in Gwaii Haanas National Park. Butterfly Tours offers quality-oriented guided kayak trips to small groups of people. Our compact groups are significantly quieter and more flexible than large tour groups. With fewer people on each trip, our guests can enjoy truly peaceful surroundings. With fewer tents, we are able to camp on secluded beaches that larger groups must pass by. Small groups tread softer upon the Earth. Our guides demonstrate and teach minimal-impact camping techniques. We encourage our guests to help preserve the ecological integrity of this wilderness area. Minimal-impact camping is accomplished far more successfully by small groups of people. Our guide to guest ratio is 2:6. This is one of the smallest ratios in Gwaii Haanas. Other outfitters offer tours with eight to ten guests, making up to twelve people in their groups including guides. Their guide to guest ratio is 2:8, 2:9 or 2:10. Larger groups can be more vociferous and may dilute the talents and abilities of their guides. Our smaller groups enjoy quieter surroundings, increased flexibility, enhanced risk management and more uninterrupted contact with the guides. For training purposes, some trips may also include an additional apprentice guide. plus the skipper, cook and two kayak guides. We offer a wide variety of tours & expeditions for paddlers with different levels of kayaking ability. The Guesthouse Vacation and Mothership Cruise provide "softer" adventures, with heated, indoor lodging each night. Our 7-day SGang Gwaay Adventurer and 8-day Waters of SGang Gwaay wilderness camping tours are suitable for relatively inexperienced paddlers, as well as accomplished kayakers. Some previous kayaking experience is highly recommended; attending a sea kayaking course prior to a trip could provide valuable skills to an inexperienced paddler. Our 8-day Waters of SGang Gwaay wilderness camping tour is suitable for relatively inexperienced paddlers, as well as accomplished kayakers. Some previous kayaking experience is highly recommended; attending a sea kayaking course prior to a trip could provide valuable skills to an inexperienced paddler. The Cape Freeman Expedition is specifically designed for kayakers who have accumulated some experience and developed reasonable boat-handling abilities. This creates a more cohesive skill level within the group. Those interested in this unique expedition are requested to complete the Butterfly way questionnaire before registering. This simple process encourages compatible attitudes and cohesive abilities on our more advanced expeditions. Evolution Expedition is a self-propelled educational adventure suitable for kayakers with experience. The Outer Coast Expedition is designed for experienced kayakers who have previously paddled with us. We explore the isolated and pristine southernmost tip of Gwaii Haanas, an area preserved in its natural state. Concentrating in the most remote regions of Gwaii Haanas enables us to experience deep wilderness during each day of our kayak tours. Here, the vast temperate rainforests include giant old-growth cedar, spruce and hemlock, entirely untouched by modern logging. Sometimes, less is more. The southern tip of Gwaii Haanas encourages this perspective. The waters surrounding the ancient Haida village of SGang Gwaay provide some of the most interesting and diverse kayaking opportunities in the entire National Park Reserve. 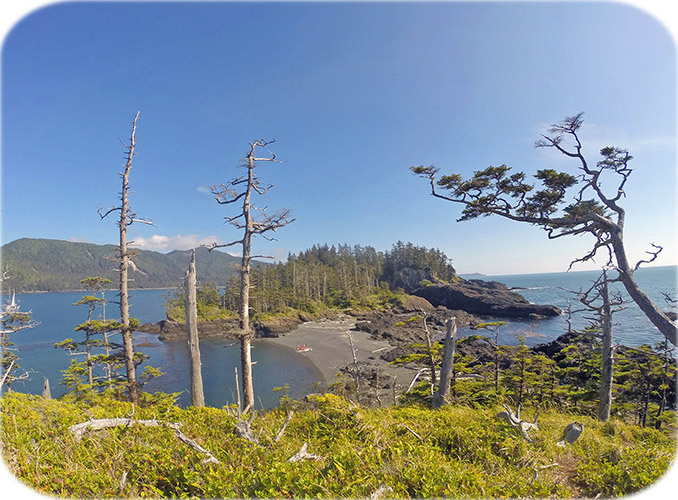 This distant region highlights the very best of what Gwaii Haanas has to offer. Here, it is not necessary to paddle long distances in order to reach the next beach. Fabulous campsites and beaches are plentiful throughout the waters of SGang Gwaay. We enjoy touring this isolated and varied coastline in detail, often pausing to observe the abundant wildlife. For several days we quietly explore the incredible and remote southern region by kayak. On the last afternoon, our guests traverse the entire east coast of Gwaii Haanas during the return speedboat ride. Long ago, we offered kayak tours up and down the east coast of Moresby Island. This is a popular route, yet we consistently found that our tour guests wanted more time to explore the fabulous and remote southern regions. In those days, we would paddle the waters of SGang Gwaay for just one or two days at the end of a southbound trip. A northbound trip felt different, as we would start in the most remote and impressive region, then spend the rest of the trip paddling away; up the east coast toward civilization. Since then, we have shifted our focus. For the past few decades, we have been very pleased with concentrating our explorations around the southernmost tip of Gwaii Haanas. Our trips are not necessarily what every paddler is looking for. There are other kayak tour outfitters offering trips up and down the more accessible east coast of Moresby Island. If you are looking for an east coast trip, we would be pleased to refer you to another outfitter. Gord Pincock is a talented, life-long professional guide dedicated to facilitating quality sea kayaking experiences with expedition participants and tour guests. Gord has enjoyed well over a quarter century of sea kayak touring in Gwaii Haanas, he has explored the Islands by kayak every summer since he was seventeen. His grounded, insightful approach to wilderness exploration is uniquely adapted to remote marine environments. Gord has earned his reputation as a patient, good-natured and entirely capable leader. Gwaii Haanas is a destination where the accumulated experiences of your guide will make a significant difference to the quality and safety of your trip. Gord has an extensive history of kayak touring throughout Haida Gwaii; he is intimately familiar with this vibrant territory, its waterways, tidal currents and weather patterns. His guiding experience and safety record are unsurpassed. Through decades of refinement, Gord's camp-craft has become renowned for its practical innovation. With durable functionality in mind, Gord has designed, modified or created many of the gear items on each trip. Gord clearly understands how high-quality, effective equipment makes such a positive difference during wilderness excursions. "The best way to learn is by teaching." Gord enjoys learning, as well as sharing his accumulated knowledge. His skillful guiding abilities have been further enhanced through many years of instructing guide certification courses. Guests of Butterfly Tours can be certain of who their guide will be; Gord is scheduled to lead each trip that we offer. Enjoy the many benefits of traveling with the most experienced kayak guide in the region. Gord is scheduled to guide each trip this summer; however, the guide schedule may be changed due to circumstances beyond our control. Campfire cooking provides an entirely different wilderness experience compared to heating food over a propane stove. Our healthy, tasty meals are professionally prepared over driftwood beach-fires, lending an aesthetic sense to our daily feasts. The fire becomes our gathering place each morning and evening. Cooking our meals over a fire brings us all closer to the ancient ways of the Haida, who once paddled their cedar canoes through the region. Our wholesome, delicious meals are of a vegetarian nature, with the possibility of adding freshly gathered seafoods. Numerous certified organic ingredients are used during our food preparation. During the Waters of SGang Gwaay tour and Cape Freeman Expedition, our last night is spent in the Rose Harbour Guest House; a lovely, rustic accommodation carefully hand-built by resident musician Götz Hanisch. After enjoying several days of paddling and camping in this truly wild region of the coast, we return to the tiny community of Rose Harbour on the second-to-last day. Here, we indulge in wood-fired hot showers and dinner hosted by the local residents. These fascinating homesteaders are happy to provide a glimpse into their unique self-sufficient lifestyles. Butterfly Tours' consistency begins with the content of this website and continues through every moment of your kayak adventure. Our ability to provide accurate and reliable information is due to the fact that your guide Gord is also Butterfly Tours' webmaster and primary contact. As well as being the most experienced kayak guide in Gwaii Haanas, Gord manages nearly all aspects of Butterfly Tours & Evolution Guide School. Benefit from direct contact with your guide before the trip. Butterfly Tours owner & guide is pleased to personally respond to inquiries. You are welcome to contact Gord to receive detailed answers to your questions.